Lava doesn’t have a fixed temperature, varying from approximately 650 to 1600 degrees Celsius (1300 to 2900 degrees Fahrenheit), and is dependent on several factors. Advancing Pahoehoe toe, Kilauea Hawaii – a type of mafic lava. Mafic lava often flows down smoothly. Photo by Hawaii Volcano Observatory (DAS). If we want to understand why and how lava achieves different temperatures, we first have to understand what it is. Lava is molten rock that has been ejected in some way, although generally speaking, lava is ejected only through non-violent eruptions. In other words, it often flows from volcanoes before the cooler temperature of the surface forces it to solidify and cool down. The difference between magma and lava has been discussed extensively here. The composition of lava can vary significantly, though it is almost always dominated by silicate minerals such as quartz, feldspars, olivine, pyroxenes and amphiboles. Based on the chemical composition, lavas (and the rocks they form) can be divided into three chemical types: felsic, intermediate, and mafic (four if one includes the super-heated ultramafic). This is just a chemical classification, but the chemistry greatly influences the temperature of lavas, as well as several other additional parameters. Felsic lavas have the highest silica and lowest magnesium concentration (rich in feldspar, and generally lighter in color than mafic lavas). They generally erupt at temperatures as low as 650 to 750 °C (1,202 to 1,382 °F) but can reach unusually hot temperatures (>950 °C; >1,740 °F), flowing for tens of kilometers. They solidify to form rhyolite-type rocks. A great example of felsic lavas is in the Snake River Plain of the northwestern United States. 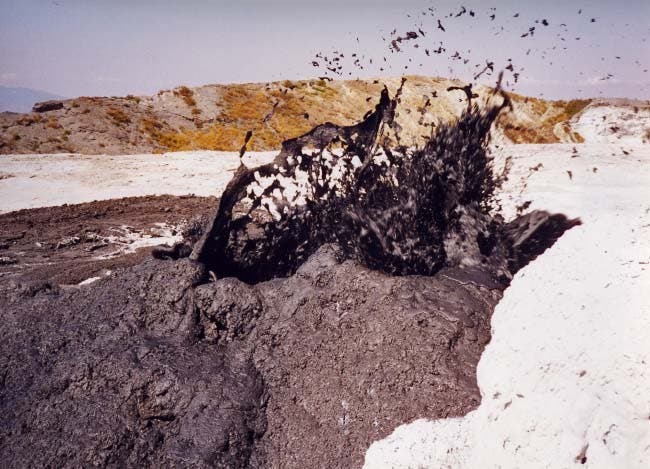 Intermediate lavas have intermediate amounts of silicate and magnesium minerals and also have intermediate temperatures. They’re hotter than felsic lavas and cooler than mafic, generally around 750 – 900 degrees Celsius. They solidify to form andesites. These lavas have a unique property: they only occur in volcanoes located at subduction zones, where tectonic plates are sinking into the mantle. Mafic lavas are lavas rich in iron and magnesium, and they’re also the most common lavas on Earth. They flow freely and fluidly in areas such as the Hawaii islands. They normally erupt at over 900 degrees Celsius (1,650 degrees Fahrenheit) and cool down to form basaltic rocks. They can be much hotter, however, going up to 1,160 Celsius (2,120 Fahrenheit), according to the USGS. Ultramafic lavas such as komatiite are rich in magnesium and have the highest temperatures. It is believed that such lavas erupted at temperatures of 1,600 °C (2,910 °F). At such temperatures, the lava viscosity is as low as water! However, there have been no modern ultramafic eruptions, with only a few occurring in the past 500 million years. It is currently believed that the Earth’s magma has now cooled too much to produce ultramafic lavas. 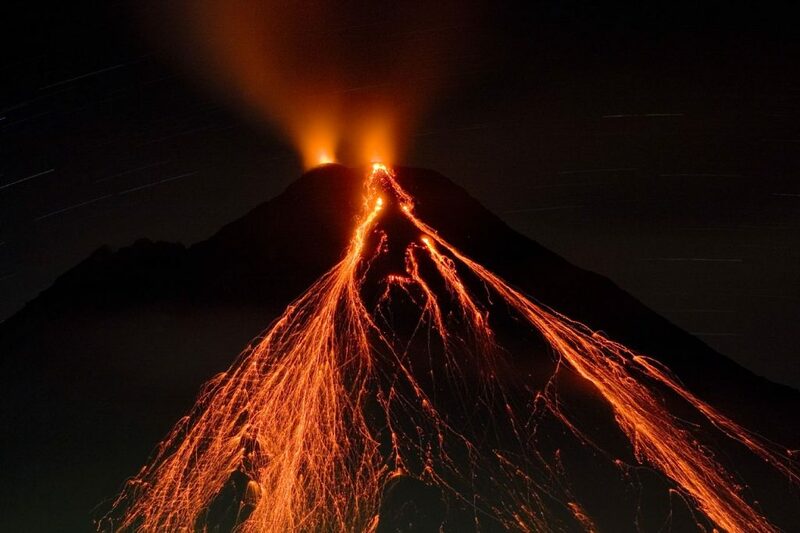 Carbonatic lava erupts as low as 500 degrees Celsius (900 Fahrenheit). This is the coolest proper lava in the world, and only one carbonatite volcano is known to have erupted in historical times — the active Ol Doinyo Lengai volcano in Tanzania. Sulfur lava flows up to 250 meters (820 feet) long and 10 meters (33 feet) wide and can be found at Lastarria volcano in Chile. They were formed by the melting of sulfur deposits at temperatures as low as 113 °C (235 °F) but they’re not really what you’d call lava. Olivine nephelinite lavas are thought to have originated from much deeper in the mantle of the Earth than other lavas. These lavas would have been extremely hot, but it’s not clear what temperature they would have had. 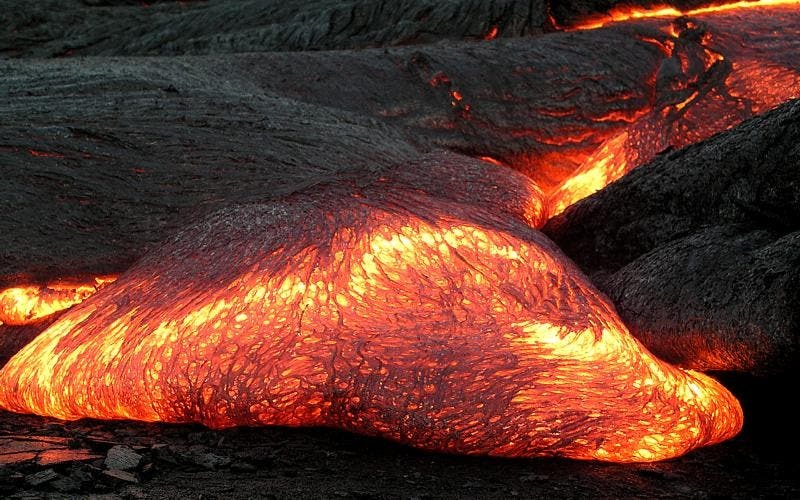 So, how hot is lava? Speaking for silicate lava, which is by far the most common, these can range from 650 degrees Celsius (1,200 Fahrenheit) in the case of Felsic lavas, to 1600 degrees Celsius (2900 Fahrenheit). Talking about current lavas, however, they shouldn’t typically reach over 1,160 Celsius (2,120 Fahrenheit).